Yeah, but: Doing as I say, as well as as I do. 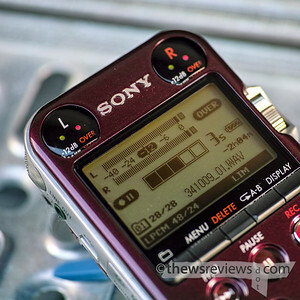 The Long Version: I've been using a Sony PCM-D50 audio recorder for ages, so whenever someone asks me for buying advice, I've suggested its newer sibling, the PCM-M10. It's 80% of the D50 for half the price, and even exceeds the abilities of the bigger unit in some ways. My arguments in its favour were so compelling, in fact, that after a few years of recounting them I eventually succumbed and bought one myself. 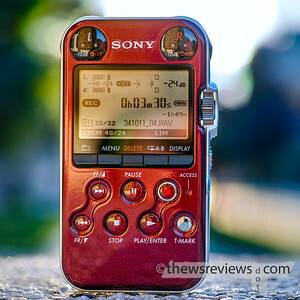 The Sony M10 is a hand-size audio recorder with excellent electronics and supernatural battery life. Yes, you can use it with $500 monitor headphones if you want to, as long as they have a 3.5mm jack, but that's not really the point. Its pair of omnidirectional microphones are very tolerant of suboptimal use, at the expense of some soundstage crispness, so it's perfect for people who just want to record good audio without fussing over the minutia. I'm primarily interested in field recording ambience and environments in the city, so I have different requirements than musicians or videographers. A low noise floor is always good, but an effective limiter that can handle loud transients is much more important. Stereo imaging matters, but so do forgiving microphones and quick startup times. And there's simply no way that I'm going to walk the streets with a blimp on a boom. For me getting the sound is more important than being able to record the highest possible fidelity, and that's where the Sony M10 comes in. The PCM-M10 is, at its heart, consumer electronics. It doesn't have the metal heft of its higher-end siblings, and cuts some corners in its controls. The worst of this is the LCD backlight being set through the menu, rather than being toggled by a dedicated button, as it's hard to see the meter display when the light turns off. It's also brutally difficult to see the numerals on the levels dial, which are only stamped on its side without any contrasting markings – although I must note that some allegedly “serious” handy recorders lack a levels dial at all. The switches on the back of the unit are easy to move accidentally, which I've resolved with some gaffer tape. And the small size of the recorder makes it particularly ill-suited to having a wind screen, with nothing much to hold one in place and no way to avoid it obscuring the LCD display or LED metering guides. 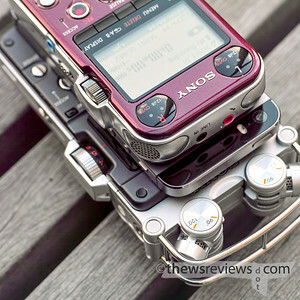 The M10 is not nearly as nice or as easy to use as my bigger Sony PCM-D50. The PCM-M10 is, on its surface, consumer electronics. It's available in black, burgundy, or white plastic; all have a wide contrasting silver band around them. My burgundy model even has little metallic flecks in the plastic, although the Black is described as matte. The microphones are hidden within the body of the unit, with small grills to cover them and no protrusions. Only the track mark button is silver, with the tape-deck transport controls being body-colour, and a black row of secondary buttons is tucked into the black surround of the LCD bezel. No casual observer is going to mistake the M10 for A Serious Piece Of Gear, which most recorders come across as, or for a stun gun, which is a real danger with the Zooms. Instead it's just another hand-sized electronic gadget of no clear purpose, and even if it is recognized as a recorder, it looks like something a student might use to hold their place while they sleep through a lecture. The M10 is not nearly as noticeable or remarkable as my bigger Sony PCM-D50. In my life "nondescript" and "inoffensive" are goals to be aspired to. The M10 fits in perfectly. The best feature of the Sony recorders are their built-in limiters. These clever devices record a secondary track at a lower gain, -12dB for the M10 and -20dB for the D50 and D100, which they normalize and cut in seamlessly to avoid clipping. The M10's levels will just read "OVER" instead of giving a positive reading like the D50 would, giving less indication of if and how the levels should be adjusted, but the magic still works well enough. 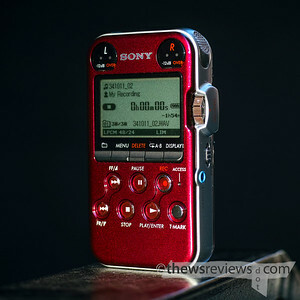 The M10 also has the Sony five-second preroll buffer, and even comes with the wired remote that lets it start recording without any handling noise. That's great when lying in wait for sound, but enabling the buffer has another enormous practical advantage. Like many recorders, hitting record doesn't actually start the recorder recording. This is a solid opportunity to set the levels, but it's really easy to not notice that the pause button is still flashing and think that sound is being captured when it isn't. With the buffer turned off the display looks about the same whether it's paused or rolling, but with the preroll enabled the zeroed time counter is replaced by bold blocks that look vastly different. And that's why I keep the preroll enabled: it's an obvious indicator of the recording state right under the meters that I'm devoting my attention to. Another Sony quirk is that there's no way to change the file name format in the recorder. It's always YYMMDD_XX, so my being in a multi-Sony environment means that using both recorders on the same day creates identical file names. (Although the M10 starts incrementing the _XX portion from _01, while the D50 starts at _00.) To get around this I've set the M10's date two decades into the future, which it accepts somewhat gullibly, even though that annoys my computer's 'list files by most recent' function. This may not be much of an issue for anyone else, anywhere, ever. One of the strengths of the PCM-M10 is that its omnidirectional microphones are relatively immune to wind. Well, gentle breezes. Maybe immune to slight drafts is a better term. Outdoors it does need a screen on all but the calmest days, but when wind does hit the M10, the effect is relatively mild. And unlike the Sony D50, which loses its mind if someone walks past its unshielded microphones too quickly, the M10 can go naked indoors with near-impunity. This is another huge advantage in the effort to be nondescript and inoffensive. When the M10 does need a hat I'll use the Røde Dead Kitten, which is originally designed for their Stereo Videomic, but also fits the D50 and similarly-sized recorders. This is pretty heavy-duty protection, and attenuates the high frequencies somewhat, but I haven't felt the need to add a lightweight screen. Sony's own M10-specific design costs almost as much as the recorder. As an aside, I'm also a big fan of Joby's tripods. I can highly recommend their low-profile Micro 250, which permanently lives on the bottom of my M10, and the recorder still happily fits in a pocket or small camera case. This makes it easy to position it away from the surface of a table; for the brave it can even be used as a stand to prop up the recorder vertically, as it has for some of these photos. And it doesn't block the battery door, so I don't need to remove it when I swap the M10's two AA cells – which I do out of habit, not necessity, since I've never had the patience to actually run a set down. The M10 has about the same footprint as a small phone – that's an iPhone 5 in the photo above – and weighs about as much as a large unpeeled banana. There's just no reason to not have it nearby. Its absurd battery life means that I keep it locked on 'hold' instead of turning it off, so it only needs a quick flip of the power switch to be instantly ready. I've lost count of the number of good sounds that I've caught with the M10 that I would otherwise have missed. I bought the Sony M10 because I thought I would use it more than the on-paper-superior D50, and I was absolutely right. It's true that I will choose to carry and use my bigger D50, with its better stereo imaging and somewhat lower noise floor, when I know that I'll be dedicating significant time to audio recording and have the comfort level to use it. This is exactly the same as choosing when to carry and use a big DSLR instead of a smaller camera. And like having multiple cameras, there have been times when I've used the little M10 even though the D50 was also in my gear bag. 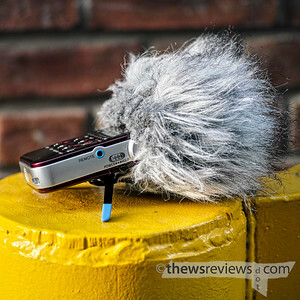 I'm wincing just a little to say this, but if I could only keep one audio recorder – a horrible thought – I'd be better served by the versatile and inoffensive M10. Not that I'm known for making rational choices, but hopefully it never comes to that.